We had such a great class on Tuesday! I can't wait to meet up with students again next week. Most of the attendees knew nothing about Copic markers, so they were excited to learn and experiment in such a relaxing way. Some came for brain stimulation reasons, some came to explore a new medium, but all left happy! 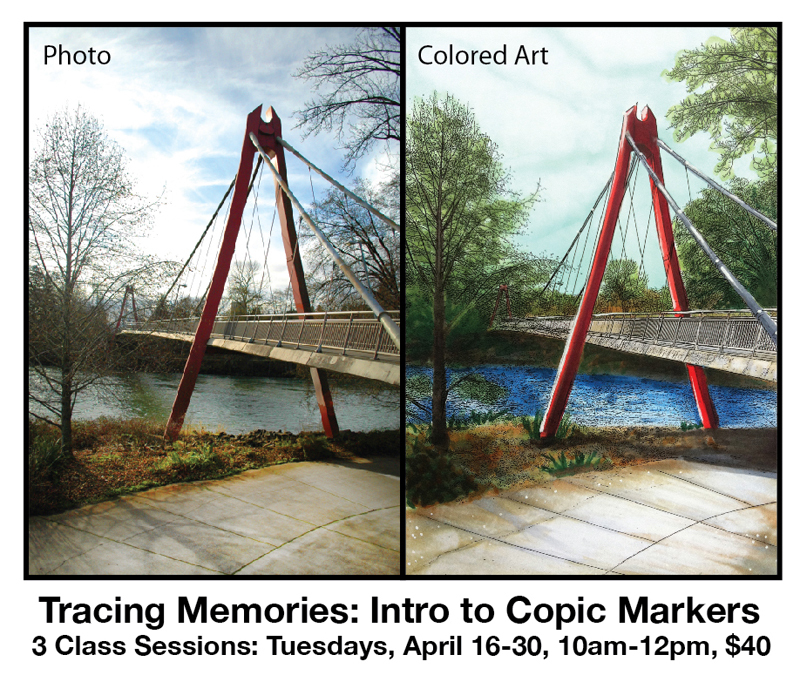 I've been working on building a new portfolio of Copic Art/Tracing Memories images, based on photos that I have taken over the last few years. 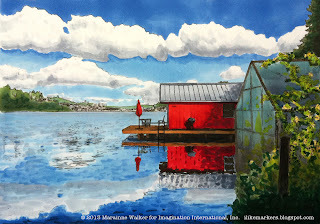 This piece is an example that I made from a photo taken at our Copic design team retreat last Fall by Debbie Olson (her photos came out much nicer than mine!). The picture is only 5" x7", and took me about an hour or two to color. A beginner could spend 3 to 4 hrs. on this picture, depending on how complex you wanted to make it. Today, I'm just going to step you through the sky/clouds. The sky in this photo is so dynamic, with the rich blues and beautifully fluffy clouds that this image quickly caught my eye for turning into an outline. 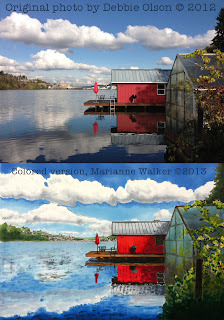 But, coloring clouds can be tricky, so let me step you through my process. I could have colored the sky with a few different methods, but I wanted to try going dark to light and see if I liked it. I started with B23 for the upper, rich blue area. Then, under the top row of clouds, I put some of the B23 and blended in B41. I don't think I'd use this technique in the future, because the blend looks a little irregular, but, this is why we experiment. I colored the B41 lighter and lighter as it got closer to the horizon (his photo makes it look grayer than it actually is). The outlines created on the computer did not have all the clouds defined, so this is where you get to decide where the clouds fit. The original photo got really detailed little clouds off in the distance, but I didn't have the patience to deal with those, so I skipped them. Now I started with my darkest color on the clouds, C3, to define my deepest shadows. I wanted my blends to look a little splotchy here, since clouds are puffy and irregular. Get a general idea of where the shadows will be from the photo, but don't get hung up on being exact. Most people who see your finished work will never see the original photo, so they won't know if doesn't match perfectly. Notice I didn't carefully blend the dark, I loosely scribbled it in. Next, I dabbed in C1. Notice how it softened those hard edges of the C3, but not too much. Again, I didn't blend much, I just dabbed and spotted colors on. Something to remember when coloring a picture is that it will not look perfect at each step. Just because it doesn't look right now, doesn't mean that it won't look right a few more steps down the road. Don't give up! At worst, just start over and get a new sheet of paper. To finish the clouds, I came in with a C0 and dabbed in my lightest gray. Once again, this softened, washed, and blended colors together. If anything looks too dark or the edges still seem harsh, then you can come in with the colorless blender and pull the grays down a bit. Be careful not to wash out the C3! If you remove too much of the gray, then you'll lose the nice contrast you see in the original photo. Luckily, you can always go back and add your shadows back in if they disappear too much. Here is the final picture again, just for you to compare. Notice how the clouds reflected in the water are a little duller, and a little more gray. I added C1 to the water far away before I layered on the B41, then, went into B23 and B99 as the water gets closer to the viewer. I used BG72, B23, B41, C1 and C3, with hints of B99 on the glass from the greenhouse. I used YG06, Y08, G29, G85, and YG63 on the withered grapevines. I added pale hints of YG23 and YG11 to suggest plants inside the greenhouse. The red boathouse is R24, R27, R39, R59. The roof is all from the Cool gray family, the brown is E35, with a gray layer. I didn't use black, anything dark is actually W7. The trees/buildings in the distance are YG63, G85, G29, and W3/W5, with a pale bit of B41 to make everything a little cooler (this helps it look farther away). As I didn't take this photo, I cannot provide this image as a freebie, but, keep looking in the future for more info about Tracing Memories and where to get images. Also keep an eye out for details on future classes. Have a great week! More classes are opening soon, so check the website frequently! 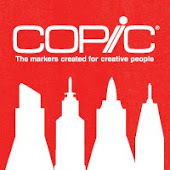 Many years ago, the manufacturer of Copic markers showed us a class they had researched and developed. This class was designed for people who are concerned about their memories, and are looking for ways to relieve stress, but be productive. In Japan, they called the program Copic Art. I've had samples sitting in my office for a long time, but never had time to develop the program in the US. Well, that has finally changed. Over the next few years, you will start to see more about our US version of this program, which we are initially calling Tracing Memories. The concept is simple, you take a photo, convert it to outlines on the computer, then you work on coloring in, with the help of an instructor, and while looking at the original photograph. You learn to pick and match colors, you make artistic choices, but you don't have to draw! And, each time you color the work, it is a mini masterpiece. In Japan, they even have art gallery shows of these beautiful pieces. Next week we will be teaching our first class in the US! It will be here, in Eugene, OR, and we will be coloring scenes from around Eugene. Eventually we will be offering training all across the country, but for now, if you are local, you are welcome to attend the first workshop. 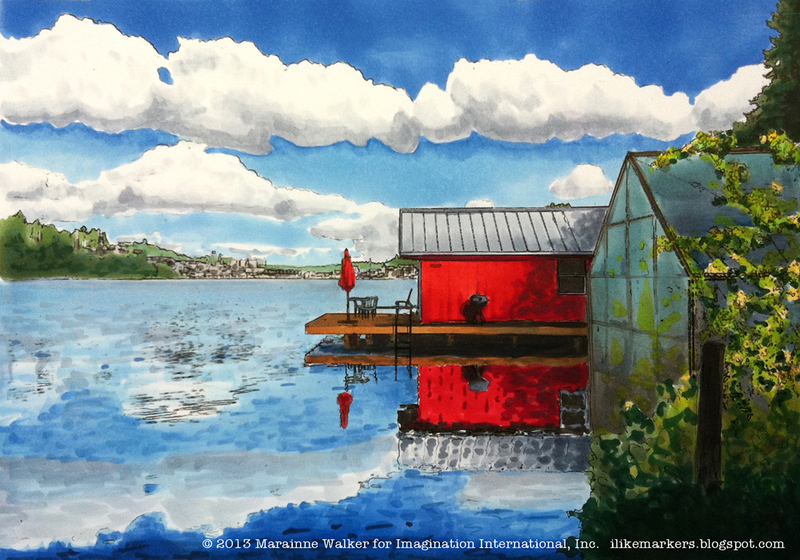 The class will be held at Maude Kerns Art Center, and registration goes through them. www.mkartcenter.org Cost is only $40 for three, 2-hr classes on Tuesdays during the rest of the month of April. I am so excited about this program! I can't wait to see you at one of these classes! We just launched our 3rd annual Park Your Art Contest! 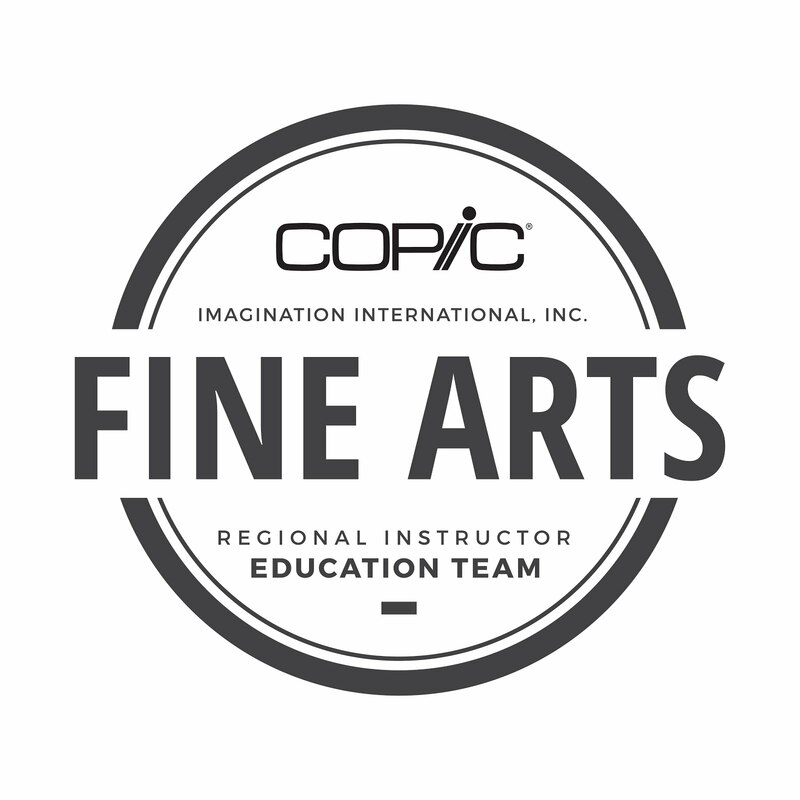 We're asking artists to use Copic art tools (in whole, or in part) to create artwork around this year's theme: Illumination. In addition to $300 cash and Copic Marker prizes, the winning piece will be publicly displayed on a downtown Eugene, Oregon parking structure - for an entire year! Second and third place winners will also receive awesome Copic prizes. 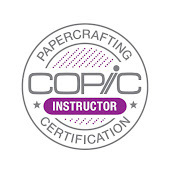 For more info on prizes and art specifications, please visit the Copic Blog.